Laughlin is the perfect place for outdoor adventure, exploration and fun! From river trips to hiking trails to picturesque golf courses, here are 14 must-do alfresco activities for you to enjoy while you’re in town. The Colorado River Heritage Greenway Trail is the ideal place to get back to nature, and hike in the idyllic desert wilderness. Explore the 10.5 miles of family-friendly trails that run alongside the Colorado River and take in the views of the Davis Dam. You’re sure to spot a variety of wildlife along the way, and be blown away by the unique scenery as you walk or cycle to your heart’s content. Restroom facilities, shade shelters and a pedestrian bridge are available for your convenience. Families with young children can also use the children’s play area. You’ll feel like a time traveler as you explore the Oatman Ghost Town – a thriving gold mining town, up until the early 1940s. Enjoy a tour of an authentic gold mine, witness a gunslingers show on main street, browse the old-timey shops, and even see where Hollywood legends Clark Gable and Carole Lombard spent their wedding night. This is a real Wild West experience and fun for all ages! Camping at the Big Bend of the Colorado River is something you won’t soon forget. The perfect escape from city life, simply pitch your tent or park up your RV and start your outdoor adventure. Plus, be sure to make use of the picnic areas, the boat ramp facilities, and the four miles of easy hiking trails through the beautiful Nevada canyons while you’re there. All camping units have water, electricity and sewage hookups, as well as a tent pad, a shade ramada, grill and fire pit. Make some real memories on an exhilarating Jerkwater Canoe trip. Start out at Hoover Dam and explore the canyons along the river on a single day trip; or opt for an extended five-day outing and camping trip with a bunch of friends. Plus, Jerkwater offers a wide range of exciting, wilderness activities to go alongside your canoe trip – from flat-water paddling to hiking to fishing. 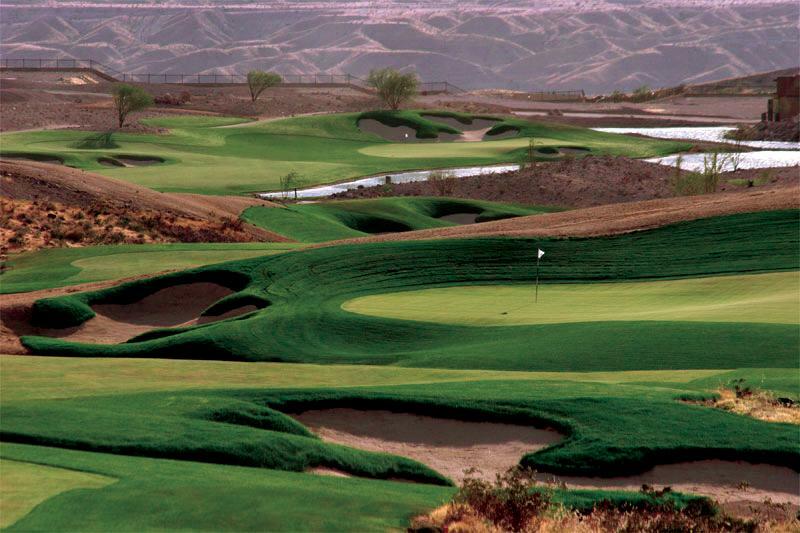 Visit Laughlin Ranch for a premier golf experience. Offering a complete package of top class golfing facilities, spa services, restaurants and Club House, teeing off here couldn’t be more satisfying. With a backdrop of the Black Mountains, its 7000 yard course – designed by the renowned David Druzisk is breathtaking – and the fairways rise and fall, broken up by a meandering array of natural streams. Watercraft Adventures promises thrills aplenty! Hire this high quality jet ski equipment and take to the majestic Colorado River for a high octane day of fun. With seven locations and serving all of the major hotels in Laughlin, this is the local jet ski rental company of choice. So rev up your engines and let’s make some waves! Boasting 200 miles of shoreline, and stunning coves and beaches, the beautiful Lake Mohave is not to be missed. Formed by the Davis Dam in Laughlin, the lake is abundant with wildlife, and makes a picturesque place for a swim, as well as a wide variety of other outdoor adventures – from fishing to boating. No trip to Laughlin is complete without a jet boat tour along the Colorado River to the famous old London Bridge (which traverses Lake Havasu). Not only will you love the high-powered, 58-mile trip along the river; passing through Topock Gorge, and taking in views of volcanic rock faces and ancient Indian Petroglyphs; but you’ll also get to spot a host of river birds and wildlife along the way. Take a gentle stroll along the landscaped Colorado River Walk, enjoy the views, and watch the boats pass by. It’s a great way to relax, get some fresh air and take a break from the hustle of the city. Plus, wildlife lovers will enjoy spotting the variety of waterfowl, shore birds and plants and flowers that grow along the riverside. The Davis Dam is an impressive feat of engineering, that lies on the Colorado River, just north of Laughlin. Drive or take a short hike or bike ride (3.5 miles round trip) to the base of this staggering manmade structure and make a beeline for one of its scenic picnic ramadas. Here, you can hike, fish, or simply soak in the scenery once you’ve finished your feast. Launching at Topock Gorge Marina, explore the unforgettable Havasu National Wildlife Refuge and Needles Wilderness Area on a kayaking trip with Desert River Outfitters. Ideal for intermediate-level kayakers; discover unspoiled coves and beaches; spot a wide variety of desert wildlife; and even see the wilderness lit up by moonlight on an overnight adventure. Hop aboard the USS Riverside for a captivating guided tour of the Colorado River. Lasting about an hour and twenty minutes, you’ll learn all about the area’s history and geography on this great-value tour; while its shaded upper deck and climate-controlled lower deck mean plenty of space to relax out of the sun.